The truth is there is no one best pillow for neck pain. 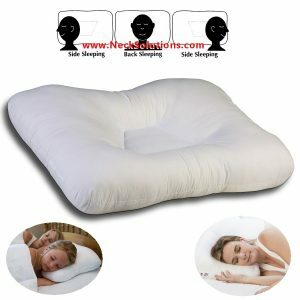 There are many causes for neck pain, therefore, no single pillow is best. 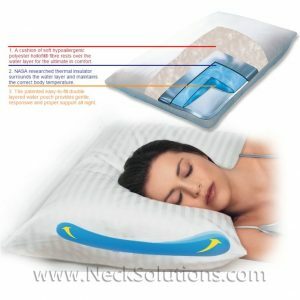 To find the best pillow, you should first seek the reasons you are experiencing neck pain. This may require professional help from medical doctors, chiropractors or physical therapists. Many companies make claims that their pillow is the best. At Neck Solutions, we say “If you are not sure, don’t buy”. The best neck pillow is not one that jumps at you from advertising or even reviews. Often, the problem with “testimonials” is that they can be falsified. Competition can invest in paying people to buy the product and write good or bad reviews, often telling them what to say and how to say it. Friends and relatives are often called upon to help. Even if true, what may be the best pillow for one person may not be the best for you, even if they sound like their condition is similar to yours. In general, cheap pillows that are mass produced and make great claims are often not the best way to go. Fancy looking pillows are not always the best and claims made from scientific studies are often misleading and may even be funded by a pillow manufacturer that will claim there is scientific proof that their pillow is the best for neck pain. 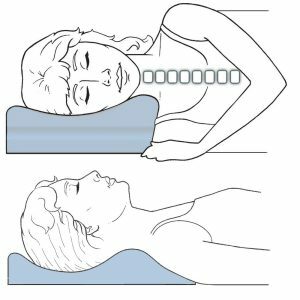 What I take from reviewing these journal articles is that if you are experiencing neck pain, changing your current pillow may make a difference. Therefore, changing to any kind of new pillow may help initially. Therefore; changing pillows through buying new ones frequently is an exercise in futility and expense. There should be a correlation between what you are trying to accomplish (reduce pain, improve posture…. ), your condition (specific pain generators…), and the most reasonable method to achieve a long term goal. If your goal is short term, take an aspirin and buy any cheap pillow. A pillow should be a part of your attempts at neck pain relief and/or posture restoration and should not be looked as, “If I can find the best pillow, I can cure my neck pain”. This is just not reasonable or realistic. 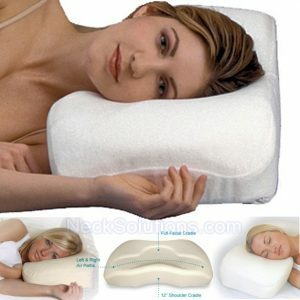 So, what is the answer to how I can find the best pillow for neck pain? The question should be, how can I find the best pillow for me? What makes this a difficult task is that you can not try every pillow. There are just too many, in too many different forms, shapes, sizes and materials. 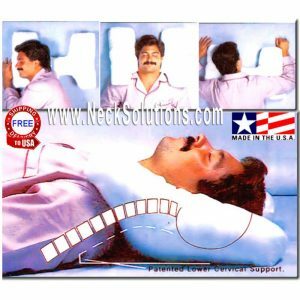 There are foam pillows, memory foam pillow, latex pillows, feather pillows, buckwheat pillows and combinations of the different types of pillows advertising neck pain relief. What we try to do is provide a variety of pillows and enough information for you to decide for yourself what the best pillow is for YOU. We also encourage you to ask questions by contacting us by our form so that we can help, and we do not mind starting a dialog to assist you. We are available via email most consistently. We just deal a lot with ALS patients, and that is our priority. Too often, we get, “I have this or that problem, what is the best pillow for my neck pain?” The response is “We do have many neck pillows and they are all designed to help with neck problems. It is important to choose a pillow that relates to your sleeping habits and one you think will be best for your sleep style. We have an article on how to best choose the right pillow and this can give you an idea of how the different types of pillows function and how they relate to your sleeping habits. So, we recommend that you have a look and read the articles, look at some pillows, then narrow your choices down to two or three that you think will be best. After this, we can provide some assistance or direction and you may contact us. 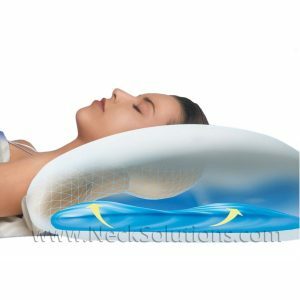 Now that we have a basis to choose the best pillow for neck pain, lets look at couple of the most popular ones and go over a few things about them. 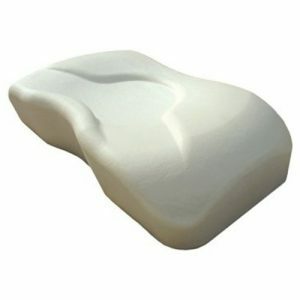 The Posture Med Contour Memory Foam Pillow is the most popular of our many pillows for neck pain. This is to say that it is the best pillow for most people. It is made of a non-molded, high quality gel memory foam with great properties you will find detailed. 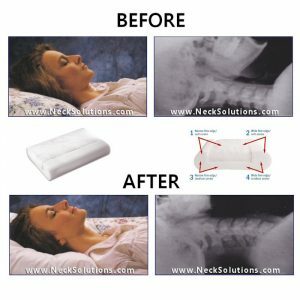 It is a soft, supportive type of memory foam and is very accommodating for neck pain. It is made under strict specifications in the US. Because it is not a molded pillow, it is more breathable and less temperature reactive than traditional memory foam pillows. It is not cheap and the cost is in the foam. This does make a difference and it has been tested over many years. It gives you a choice of five and four inch height lobes or contours and each has its own shape. Because the pillow is accommodating due to its properties as mentioned previous, it tends to compress the right amount necessary based on your head weight, whether you are sleeping on your side or back. The pillow will last for years without breaking down and needs no break-in time. 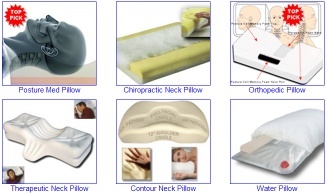 The Therapeutic Pillow is the most popular of our separate section pillows for neck pain. This is to say that it is the best pillow in this design for most people. The foam is more consistent than fiber. It is made of a high quality recycled foam with a medium density – just right to maintain it’s orthopedic design. The upper back extension flows smoothly into a neck roll and head cradle for back sleeping. In side sleeping, you have proper shoulder height and contour to prevent neck/shoulder compression. The side portions are somewhat unstable, creating a degree of activity that is not perceptible, but can help with increasing blood flow and stabilization of muscles, which can help neck pain. 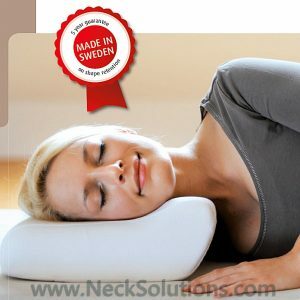 It think this is the best pillow for neck pain, HOWEVER; Because it has separate areas for back and side sleeping, it requires you to be able to move consciously to change positions. The foam is made very well and the properties go well with the ergonomic design. It comes in many different heights and you can measure which is the right height for you. This keeps you in the optimal posture and position in back and side sleeping. So, if you bought a pillow and realize that you have to adjust the pillow every time you change positions to get the best support, and you do not like having to do this, you need to go with a uniform height pillow (the right height contour options) and not a variable height pillow. So, which of the above two is best for neck pain? Well, the therapeutic pillow is good for a more acute pain, such as a recent injury to the neck. Perhaps I can explain it best by using myself as an example. 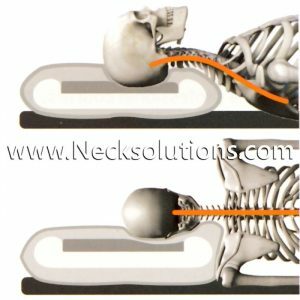 I have had many cervical spine problems over the years. The main problem is early onset and progressive degenerative disc disease. I find the posture med contour to be helpful for most of the time. However, when I have an acute flare-up of pain, I switch to the therapeutic pillow. When I am in a lot of pain, it is no problem consciously moving from one position to another. This can be affected by some pain medicines, so keep that in mind. More on this under two pillow strategies. 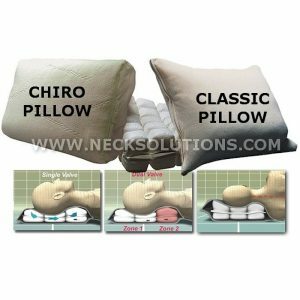 Now, the purpose of this is not to go over each pillow, there is more information in the above mentioned article on how to choose the best pillow for neck pain. 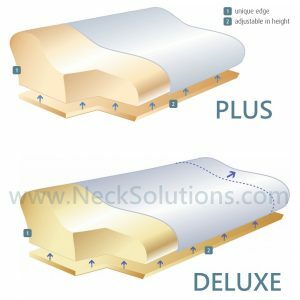 The above example showed two of our most popular pillows for neck pain and how they compare and which might be the best for your neck pain. This does not mean you need two pillows. Both the therapeutic and posture med are good for acute and chronic conditions. This is just an example of what works for me. You may find the posture med best for acute conditions or flare-ups and the therapeutic best for more chronic conditions. Over the years, I have received more and more feedback regarding the efficacy of using the 2 pillow strategy to manage acute and chronic conditions; both from customers and professionally. I will just close this article by providing an answer I gave to someone asking about two different pillows. 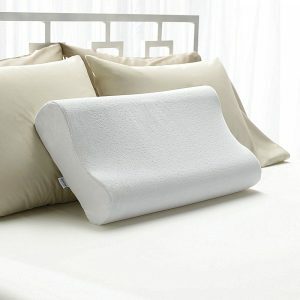 The contour pillow for side sleeping and the therapeutic pillow, so you can see how I responded. The side sleeper pillow is designed specifically for side sleeping and you have to be sure that you only roll over on your back while sleeping for short periods. It can be measured to fit the correct height while side sleeping which would be different than for back sleeping. 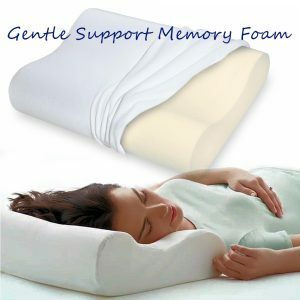 It is a soft memory foam, quite comfortable and very well made. Again, it is for side sleeping and the same goes for the shoulder cut out pillow (one height only – but really nice). 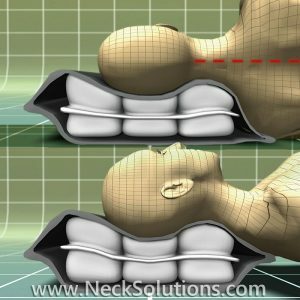 Similarly, the therapy neck pillow has raised sides for the correct height while side sleeping, but it also has a mid section with a neck roll for back sleeping along with a cervicothoracic extension to support the upper back. With this pillow, you need to make sure you consciously change positions during the night, but it will have very good positioning for both back and side sleeping. 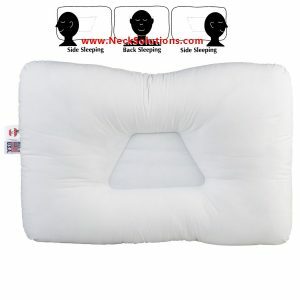 If you think you cannot keep from rolling on your back while sleeping with the contour pillow, or if you do not think you can consciously change positions at night with any variable height pillow, then you should use a one without separate sleeping areas, like a standard contour pillow or one with a uniform height. 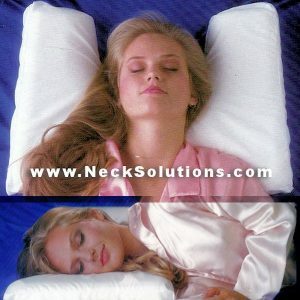 So, from specific pillows, you can get a general feeling and this should help you wherever you go to get the best pillow for neck pain. 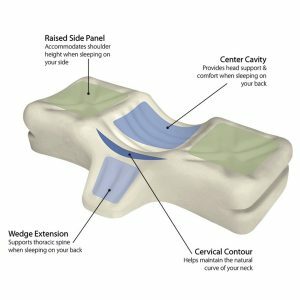 I hope this helps give you some insight into how to find the best pillow for neck pain. Again, read the article on tips on choosing a pillow. Hopefully, this will provide YOU with the best pillow. If you are still unsure, narrow your choices down and contact us or what or who you trust to offer the best help.